In what has erroneously been referred to as "Cardle v Sheeran", in fact it was two of Matt Cardle's co-writers that brought an action in June 2016 against Ed Sheeran, his co-writer Johnny McDaid, and Sony/ATV Music Publishing, Warner Music Group and Atlantic Recording Corporation (the publishers and record label of the song Photograph) for infringing the copyright in their song Amazing. The lawsuit was filed in California, claiming that the melody and chords of the chorus of Photograph copied virtually verbatim the chorus of Amazing, and concluding that "Plaintiffs are entitled to damages, including the substantial profits of Defendants, as will be proven at trial, which, upon information and belief, are believed to exceed $20 million". The lawsuit claimed that Harrington and Leonard first contacted Sheeran's publishers in December 2015 and continued to attempt to settle the claim before starting legal proceedings. The case never reached court and it was subsequently reported in March 2017 that a settlement had been reached between the parties. "That was written on the Snow Patrol tour in May 2012, in a hotel room in Kansas. My friend Johnny McDaid who plays guitar and keyboards with them was on his laptop, and he had a loop of this piano piece just going on and on. I was sat on the floor making a Lego X-Wing Fighter to give to his sister for a charity auction and this piano loop keeps playing, and I start singing a line and the song kind of unravelled from there. We sat for about four hours, me making Lego, and him on the laptop, just building stuff and then I picked up a guitar and we properly structured it. I think Photograph is the backbone of the whole record, when I first wrote it Photograph was my insurance - I knew I had at least one good song for the next record! And it was actually my insurance record for a very f***ing long time to come. All the stand-out songs were the last ones to be written." The chord progression in the chorus of both songs identical, the much-used I V vi IV pattern (in C major the chords are: C G Am F). However, this in itself would not be sufficient for a challenge to succeed. The same chord progression features in thousands of songs, The Beatles Let It Be, Adele's Someone Like You, and U2's With Or Without You, among many others. The most striking similarity is in the melodies of the two pieces, which mirror each other almost identically. 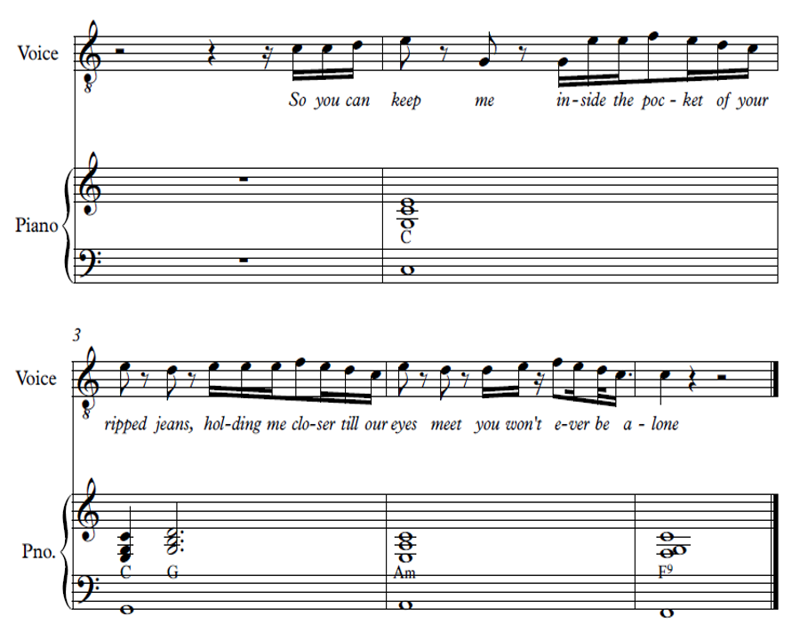 The phrases each end in the same place, after the second beat of each bar, with the next phrase starting on the third beat. The lawsuit claims "willful copyright infringement", stating that Sheeran and McDaid "copied, and exploited, without authorization or credit, the work of other active, professional songwriters, on a breathtaking scale, unabashedly taking credit for the work of these songwriters by claiming it to be their own. This copying is, in many instances, verbatim, note-for-note copying, makes up nearly one half of “Photograph", and raises this case to the unusual level of strikingly similar copying. While Sheeran, McDaid, and the other Defendants received career-defining accolades, awards, and a fortune for “Photograph,” the true writers of much of “Photograph” received nothing, and, following notice and a failure to cure, bring this action to vindicate their rights for the deliberate taking of their work, to recover damages, and to ask, as the law provides, that Defendants be required to disgorge their ill-gotten profits attributable to their infringement". "The sheer magnitude, and verbatim copying of “Amazing” by Defendants, is so blatant in both scale and degree, that it raises this matter to an unusual level of striking similarity where access is presumed". 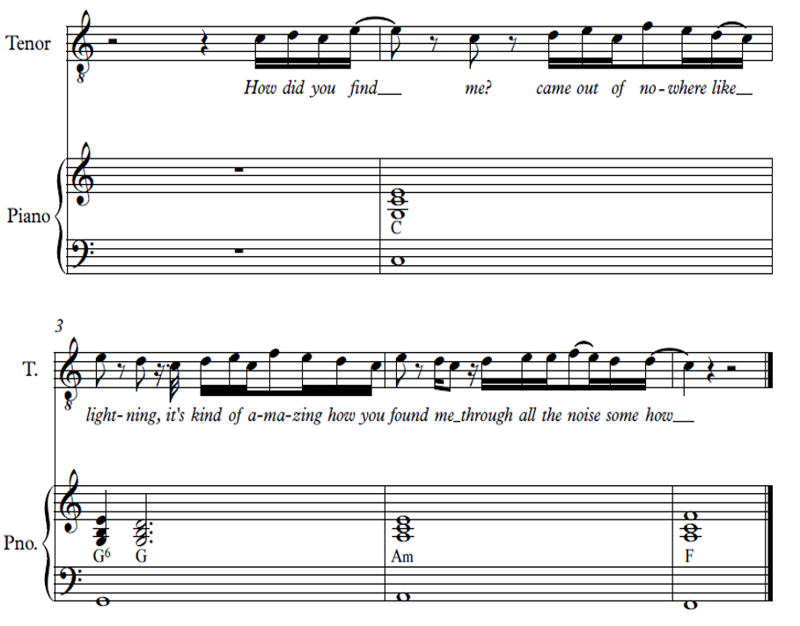 "Out of the 61 notes in the chorus section of “Photograph,” approximately 70 percent of the notes are identical to or substantially related to notes in the chorus section of “Amazing”. Further, 64 percent of the notes in the chorus section of “Photograph” are identical to the notes in the chorus section of “Amazing”. "Both the “Amazing” chorus, and the infringing “Photograph” chorus, utilize similar structures of the songs (both have verses followed by bridge and chorus sections), and the first chorus of each song is half as long as the chorus sections that follow." "Both the “Amazing” chorus and the infringing “Photograph” chorus have an added resolving chord at the end of each song and in one of the previous chorus sections." It would be a tough job for any musicologist to defend this case, as there is such a clear similarity between the notes and chords of both choruses. It is true that the songs are in different keys, and this in itself causes the sound to be less obviously identical. Had both songs shared the same key the similarity would have sounded all the more striking. The melody and lyrics of the verses are entirely different, which is why the court papers focused solely on the chorus. The lyrics and story of both songs are different, and no claim was made of infringement of lyrical content. The score of Photograph, below right, has been transposed from its original key of E major, to C major, the same key as Amazing. This makes a comparison of the two easier. Even if you are unable to read music, you should be able to see the similar shape of the notes between the two examples. (Stannard/Howes/Harrington/Leonard/Cardle) © Sony/ATV Music Publishing (UK) Ltd/ BMG Rights Management (UK) Limited/Stage Three Music Publishing Limited. Recording by Matt Cardle, ⓟ 2012 Syco Music/Columbia Records. It was reported in April 2017 that the case had been settled, though the terms were not disclosed. The settlement does not necessarily reflect an admission of liability, but some reports reference a share in royalties from Photograph now being paid to the two co-writers of Amazing. Interestingly the three other co-writers of Amazing (Matt Cardle, Ash Howes and Richard Stannard) do not receive a writer share of royalties from Photograph, suggesting that they did not contribute material to the chorus of Amazing, which was the only part of the song referenced in the law suit. This is also confirmed by the lawsuit which records that Harrington and Leonard sent Matt Cardle's producer the first version of Amazing, which was subsequently developed by Cardle, Howes and Stannard before Cardle's recording of the song. This is almost certainly a case of "subconscious copying", as was found in the US case of George Harrison's My Sweet Lord with The Chiffons' He's So Fine. Harrison did not knowingly copy the melody and chords, but the Chiffons song was known to him from its release in 1962. Perhaps the writers of Photograph had heard the song Amazing earlier - it was released as a single in 2012 - and the chorus had been subconsciously reproduced in Photograph. It would be hard to argue against this case, as the melodies carry such a large coincidence of same notes, rhythms and underlying chords.